Lt. Gen. Theophilus Danjuma(retd) a former Minister of Defence and Solomon Asemota (SAN), both members of the National Christain Elders Forum have expressed their dissatisfaction on the congratulatory visit made to President Buhari on his purported victory in the 2019 general elections, saying it is “morally and spiritually reprehensible”. 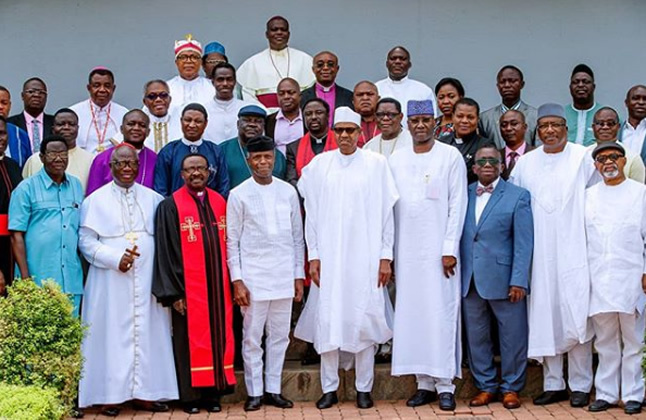 The organisation alleged that from “the ill-advised congratulatory visit to President Buhari,”, which it said amounted to subjudice, it should be clear to every Christian of good conscience that the President of CAN, Rev. Sampson Ayokunle “is running CAN as an appendage of the All Progressives Congress.” According to the elders, the action of the CAN President, was a further confirmation of all their protests and petitions in 2018, querying his faithfulness to Christ and to His Church. NCEF in a statement by Asemota (who is its chairman) titled, ‘Not on our behalf, CAN President, Not on our behalf,’ obtained by journalists in Abuja on Monday, said such visit was “subjudice” as the determination of who won the 2019 general election “is still in court.” Apart from Danjuma and Asemota, other members of NCEF are Prof. Joseph Otubu, Gen. Joshua Dogonyaro (retd. ), late Archbishop Magnus Atilade, Dr. (Mrs) Kate Okpareke, Dr. Ayo Abifarin, Gen. Zamani Lekwot (retd. ), Elder Moses Ihonde, Elder Nat Okoro and Elder Matthew Owojaiye. Other members included Justice Kalajine Anigbogu (retd. ), Elder Shyngle Wigwe, DIG P. L. Dabup, Sir John W. Bagu, Dr Saleh Hussaini, Elder Mike Orobator, Justice James Ogebe, JSC (retd. ), Dr Chukwuemeka Ezeife, Chief Debo Omotosho, Dame Priscilla Kuye, Dr S. D. Gani, Mrs Osaretin Demuren, Prof. Yussuf Turaki; late former General Secretary of CAN, Dr. Musa Asake and Bosun Emmanuel (Secretary). The statement read in part, “It is therefore premature and presumptuous for anyone to congratulate President Buhari for “winning” an election that is contested in court. The NCEF wishes to state that the congratulatory visit to Aso Villa by CAN could not be in the interest of Nigerian Christians who daily bear the agony of thousands of their brethren being killed, maimed, displaced and marginalised in the jihad launched in the northern parts of the country.